From his vantage point as former adviser to one of the Papandreou governments, James Petras examines how the Socialist Papandreou dynasty has, ever since World War II, relentlessly turned Greece into a client state, surrendering sovereignty and sacrificing class solidarity for patronage. Currently mired in debt and faced with mass unrest, Prime Minister George Papandreou is perpetuating the same logic, having turned to foreign bankers and imperial powers for direction while cracking down on the social protests that are rocking his country. During his electoral campaign Papandreou promised a modern social welfare state with a priority for social investments in public health, education and ameliorating poverty. 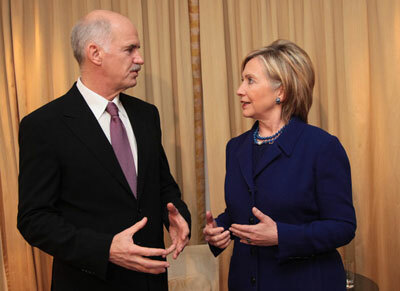 Once in office, true to the Papandreou tradition, he did an about face. Striking an indignant posture he claimed to “discover” that the Greek treasury was empty and the country was over indebted and that the only solution was to slash living standards by reducing salaries, and savaging wages, social programs and pensions in order to pay the foreign bankers. Like his familial predecessors no effort was made to collect back taxes from the rich or embargo the secret foreign accounts of the bankers, corporate executives, ship owners, stock speculators, consultants, investment brokers who swindled Greek taxpayers and pensioners of billions of Euros. No effort was made to recover the debts owned by the private sector to the state financial institutions. On the contrary Papandreou turned to the Wall Street swindlers – Goldman Sachs (who, in 2001, facilitated the pillage of public loans for private gain) – for advice and support. 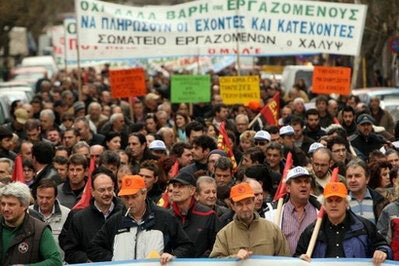 Demonstrators took to the streets in Thessaloniki on March 11, during a 24-hour general strike to protest the government’s austerity plan. The political history of the Papandreou family is a Greek tragic-farce; the tragedy of a people who fought the good fight again the Nazis and their collaborators only to be savaged by the rising new Anglo-American rulers. The heroic Polytechnical University student struggle (1973) against the US backed military dictatorship ended up witnessing the rise of a pseudo-populist demagogue (Andreas Papandreou) who promised democratic socialism and ended up socializing the private debts of capitalist kelptocrats. And now the last (hopefully) in the line of imperial sycophants (George Papandreou) who promised progressive changes and imposed regressive policies, while handing over the keys to power to his overseas imperial overseers. Beyond the political idiosyncrasies of Greece, the history of Greek Social Democratic regimes illustrates their historical role as the saviors of capitalism in crises. They are allowed, by the foreign and domestic elites, to come to power because they have the popular backing to implement the harsh reactionary policies which the established discredited rightists are too weak to impose. In embracing and enforcing their unpopular and retrograde polices, the Social Democrats profoundly alienate their working class and lower middle class supporters – they commit political suicide. But for Social Democrats, the Papandreou’s of Europe, they served their purpose: they turned back the tide of radical or revolutionary change. They sacrificed their regimes but saved the capitalist state. The most hopeful and promising change today is that the Papandreou – PASOK mystique has evaporated; even the most loyal socialist trade union official dares not raise their hand to stay the movement … nor do they dare point a revolutionary way out … So the general strikes will continue … the anarchists will launch their missiles … the levels of popular anger is rising … and the struggles will continue.